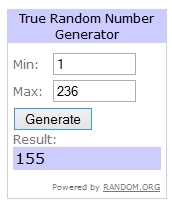 Congratulations #155 AVI who did know you could get all 4 cards! I will contact you soon via E-mail. You not only get the power brick, but you are in the running to win Silver Medallion status with Delta next year! Now to the results a total shock to me. Here are the numbers. Wow! I was expecting the numbers the other way. Last time I had 100,000 SW AIR points I redeemed them for Walmart gift cards when they had a 20% off deal as I just don’t fly SW AIR. Now I think I will save some for mileage runs as for me, Midway in Chicago is under a 2 hr drive and SW does fly many places Delta does.